Noah Picton, left, sets up to fire a pass downfield for the Rams. Judging by the pre-season Canada West Conference coaches’ poll, Saskatchewan’s two university football programs aren’t expected to do squat in 2017. On Wednesday, Canada West released the annual pre-season coaches’ rankings for the six-team conference, and the University of Regina Rams were rated third and the University of Saskatchewan Huskies placed fifth. The University of Calgary Dinos topped the poll, and the University of British Columbia Thunderbirds came in second. The University of Manitoba Bisons are ranked fourth, while the University of Alberta Golden Bears are sixth. At this snapshot in time, the coaches in the conference are predicting the Dinos and Thunderbirds will square off in the Canada West final for the third straight year and battle for the Hardy Cup. Last year, the Dinos fell in the U Sports title game, the Vanier Cup, 31-26 to the Universite Laval Rouge et Or. In 2015, the Thunderbirds won the Vanier Cup downing the Universite de Montreal Carabins 26-23. While it would be natural to rank the Dinos and Thunderbirds where they are due to recent history, the coaching staffs of the Rams and Huskies should take full aim at playing the disrespect card. Huskies QB Kyle Siemens (#19) escapes Rams DL Nicholas Dheilly (#99). The rankings reinforce the notion that neither Saskatchewan university team will get to the point where they can win the conference title. The Rams topped the Canada West regular season standings with a 6-2 record last season, which was a first for the program since leaving the Canadian Junior Football League for the university ranks in 1999. They fell in a Canada West semifinal contest 40-34 to the Thunderbirds. U of R posted a 6-2 mark on the heels of an 0-8 campaign in 2015. The coaches’ poll is basically saying the season the Rams had in 2016 under first-year head coach Steve Bryce is an aberration. They are expected to fall back in the Canada West pack. So much for Rams quarterback Noah Picton becoming the first player from his program to win the Hec Crighton Trophy as the most valuable player for U Sports football in 2016. The Huskies finished third in the conference with a 5-3 record last year before seeing a three game winning streak end in the other Canada West semifinal playoff game. The Dinos thumped the Huskies in that playoff encounter 47-17. Atlee Simon (#36) motor downfield for the Rams. Since that time, the Huskies have undergone an overhaul in the coaching department. Legendary head coach Brian Towriss, who will be inducted into the Canadian Football Hall of Fame on Sept. 14 in Hamilton, Ont., resigned last December. Former Montreal Alouettes star offensive lineman Scott Flory, who was the Huskies offensive coordinator, became the new head coach. Former CFL quarterback Marcus Crandell was brought on as the new offensive coordinator, former CFL linebacker and Huskies player Warren Muzika rejoined the program as the new defensive coordinator and veteran U Sports coach Jerry Friesen assumed the role as special teams coordinator. The Huskies return a large chuck of their players from last year, but the coaches’ poll says the program will take a big step backwards under the guidance of a new sideline staff. That step backwards predicts missing the playoffs for the first time since 2000. The first reaction in seeing the Canada West coaches’ poll was that both the Rams and Huskies are better than where they lined up in the rankings. In the inaugural U Sports top 10 football rankings voted on by select members of the media, the Dinos are rated fourth, the Rams fifth, the Thunderbirds are seventh, and the Bisons are 10th. The Rouge et Or are rated first. Anyone who has watched the Canada West Conference knows the results can go all over the place. Teams that lose badly one week can rebound and beat a good team the next week. RB Colton Klassen, right, attacks the hole on a run for the Huskies. The Thunderbirds can always be viewed as a favourite due to the fact Blake Nill is that team’s head coach. Nill guided the Thunderbirds to the 2015 Vanier Cup title win, and before joining UBC before the start of the 2015 campaign, he was the head coach of the Dinos when they won six straight Canada West titles from 2008 to 2013. Going into the current season, the Rams and Huskies are in position where they have nothing to lose and everything to gain. They are both capable of having outstanding campaigns. Both teams open their respective regular seasons on Friday. The Rams host the Thunderbirds at 7 p.m. at new Mosaic Stadium, and the Huskies travel to Winnipeg to face the Bisons at 7 p.m. local time at Investors Group Field. At this point in time, both the Rams and Huskies have been slighted. Here is hoping they will go out and earn a new sense of respect. The Huskies O-line lines up against the Dinos D-line last season. After being dropped by Shaw following last season, Canada West football will be back on television for anyone that gets SaskTel maxTV in Saskatchewan and Telus Optik TV in Alberta and British Columbia. Canada West announced the TV developments for the 2017 season on Wednesday. A total of 12 regular season games and all three conference playoff games will air on the SaskTel and Telus cable brands. Every regular season game will feature at least one of Saskatchewan’s two university teams. The Rams will appear on television at least seven times, while the Huskies will be on at least six times. “Canada West is thrilled to showcase our outstanding football student-athletes across Western Canada on our new distribution network,” said Canada West VP of marketing and communications Adrienne Healey in a release. Healey doubles as the athlete services officer at the U of Saskatchewan. Kudos needs to be given to those in Canada West marketing arm for finding a new television home for the conference’s football games. It will be interesting to see if this will cause some to switch their cable provider. Kwame Opoku scored his first career U Sports goal on Sunday. It looks like the reload might not be a long one for the University of Saskatchewan Huskies men’s soccer team. While you can’t get over excited about one weekend of play, you can get optimistically excited. Having missed the playoffs last season, the Huskies opened their current U Sports campaign sweeping the University of Lethbridge Pronghorns in a two-game series at PotashCorp Park. The Huskies took the opener 1-0 on Saturday and closed the series with a 2-1 victory on Sunday. A year ago, the Pronghorns went 8-6-2 to finish five points ahead of the Huskies, who were 6-7-3, for fourth place and the final playoff berth in the Prairie Division of the Canada West Conference. Actually when you watched the two clashes, you come away impressed with how well “the beautiful game” can be played in the men’s U Sports ranks. Both sides moved the ball well and both contests had real good pace. Had the Pronghorns manufactured about a couple of more plays each game, they could have come away with two road wins. On Saturday, Huskies third-year midfielder Marcello Gonzalez scored the contest’s only goal in the 59th minute and fourth-year keeper Patrick Pranger made four saves to give the host side the victory. Matthew Vandervoort took the loss in the Pronghorns goal. On Sunday, the Huskies took a 1-0 lead late in the first half, when a corner kick from third-year midfielder Gabriel Buatois bounced around inside the box and deflected into the Pronghorns goal off Vandervoort. Early in the second half, rookie midfielder Kwame Opoku scored his first U Sports goal to give the Huskies a 2-0 edge. U of S’s Jakub Rogowski collides with U of L’s Matthew Vandervoort. In the 76th minute, Pronghorns rookie midfielder Ellie Davies scored on the penalty shot to cut the Huskies lead to 2-1. The visitors continued to press, but they couldn’t find the equalizer. Huskies keeper Kyle Moore made three stops in the win, while Vandervoort stopped five shots in the setback for the U of L side. For most of both outings, the Huskies did well advancing the ball up the pitch with triangle passing, and the players who didn’t have the ball presented passing outlets for the teammate that did have the ball. U of S also did well in withstanding the Pronghorns pressure at the end of both contests to preserve the win. With wins being worth three points in the standings in soccer and ties worth just one point, the fact Huskies didn’t give up the lead late was big. Now three years removed from winning the Canada West title in 2014, the current Huskies are more on the young side with their roster containing 10 rookies and five players in their second year of eligibility. While they have no fifth-year players, they do have six players in their fourth-year of eligibility to provide some veteran presence in the quest to end a one-year absence from the post-season. For the first time out, youth helped carry the day on two occasions for the Dogs. Hopefully, they can keep the good vibes going as the campaign progresses, but win or lose, they should be fun to watch. The Huskies return to action this coming Saturday and Sunday, when they travel to Edmonton to face the MacEwan University Griffins and the U of Alberta Golden Bears respectively. The Saskatoon Blades wrapped up their training camp by signing their possible goalie of the future. On Tuesday, the Blades inked 15-year-old Burnaby, B.C., product and netminder Koen MacInnes to a standard WHL player agreement. MacInnes, who stands 6-foot-1 and weighs 165 pounds, was selected in the second round and 35th overall in the WHL Bantam Draft held in May. Last season, MacInnes played goal for goal for the Burnaby Winter Club’s top tier bantam team and backstopped the squad to a Western Canadian Bantam Championship title. MacInnes isn’t eligible to start playing in the WHL on a full-time basis until the start of the 2018-19 season. The Blades entered Tuesday with 38 players on their roster including 21 forwards, 13 defencemen and four goaltenders. Not included in those numbers were injured forwards Lukus MacKenzie and Tyler Lees, who both have upper body injuries. The Blades held their Blue and White game on Tuesday, where the Blue side prevailed 5-1. The contest, which included three periods that were 15-minutes in straight time, was played at a very fast pace. Both sides were fairly focused in transitioning up ice with speed. Overage centre Cameron Hebig was looking fairly good. He missed all of last season due to injury after piling up 26 goals and 43 assists in 59 regular season games as an 18-year-old in 2015-16. At the moment, the Blades have four overage players on their roster including Hebig, forward Braylon Shmyr, defenceman Evan Fiala and goaltender Logan Flodell. WHL clubs have to cut down to three overage players on Oct. 10. The Blades open their exhibition schedule traveling to Regina on Thursday to face the Pats. “The Bridge City Bunch” opens the regular season on Sept. 22, when they host the Swift Current Broncos at 7 p.m. at the SaskTel Centre. The Hilltops offensive line has run over the opposition so far this season. In football, you always have to show love to your offensive line, and the Saskatoon Hilltops are rounding out to be good in that department. The Toppers were expected to go through some growing pains in that area thanks to the graduations of Tyler Hoath, Drake Unger and Cord Ivanko. When the Hilltops trounced the Ottawa Sooners 49-15 at Saskatoon Minor Football Field on Saturday, they started Kirk Simonsen at right tackle, Taylor Elderkin at right guard, Patrick Arno at centre, Jack Sloboda at left guard and Mason Ochs at left tackle. Simonsen and Elderkin were regulars last season, while Sloboda missed much of the 2016 campaign due to injury. That group of five has been a main cog in helping the Toppers get out to a 3-0 start and pile up the yards offensively. Thanks to the offensive line, the Hilltops are still finding a great balance offensively, where the yards they pile up through the air and along the ground are split 50/50. Hilltops offensive line coach Donnie Davidsen has to be given credit here in helping the team not a miss a beat in this area. The Hilltops are off until Sept. 9, when they host the Regina Thunder (2-1) at 7 p.m. at SMF Field. The Toppers are also hosting their annual “In the End Zone” fundraiser before the clash with the Thunder. This year’s guest speaker is legendary former Saskatchewan Roughriders receiver Don Narcisse, while Hilltops head coach Tom Sargeant will also give a pre-game address. Tickets are $680 for a table of eight or $85 per single ticket and can be purchased clicking the link right here. When it comes to the local Saskatoon football front, no one is better at doing statistics than Danny Servetnyk. Servetnyk can be found in the press box at Saskatoon Minor Football Field at all Saskatoon Hilltops and Saskatoon Valkyries games as well as all high school games played at the facility. In what seems like a matter of a handful of minutes following Hilltops and Valkyries contests, he has the statistics for that night’s game complete, and they are pristine. During the high school football season, you can expect an email with all the stats from that night’s games moments after the last contest concludes. They are as good as the statistics from Hilltops and Valkyries. I definitely thank Servetnyk big time for the efforts he puts in compiling football statistics. It helps make my blog posts and stories that much better. Servetnyk made his mark as an athlete back in the day in the late 1970s and early 1980s building storied career playing football with the Hilltops and wrestling with the University of Saskatchewan Huskies men’s team. He was inducted into the Saskatoon Sports Hall of Fame in 2003. I felt stunned and sad when learned of Graham Tuer’s passing around the lunch hour time here in Saskatoon. He died at the age of 87 in a Regina hospital on Tuesday morning. He entered hospital late last week after suffering two heart attacks. Here in Saskatoon, Tuer’s passing was talked about often during the Saskatoon Blades intrasquad Blue and White game. Tuer, who was inducted into the Saskatchewan Hockey Hall of Fame on July 22, was born in North Battleford and spent more than 50 years in and around arenas in Western Canada in various roles with various teams, leagues and organizations. When I would venture to the Brandt Centre in Regina last season to cover Pats contests in the regular season and during their run to Game 6 of the WHL Championship series, I visited with Tuer regularly before most games. I always enjoyed those visits, and I will cherish them even more now. Tuer had been with the Pats as a scout and their liaison with Hockey Regina since 2015, and served with the team earlier in his hockey travels. Tuer’s presence added to my familiarity of being at the Brandt Centre after being away from that facility for a number of years. I remember visiting him when I covered the Pats as a beat writer during the last half of the 1999-2000 and first half of the 2000-01 seasons. While I will miss Tuer, I know a lot more people in hockey will take his passing to heart way more than me. He had a huge influence on a number of people involved in the game. Over the next few days, I know I am going to learn a lot more about Tuer’s impact on the game. Gregg Drinnan wrote a great piece on Tuer for his Taking Note blog. It can be found right here. I was back in the Saskatoon Express this week with a cover story on new University of Saskatchewan Huskies football head coach Scott Flory. Actually, I got to be part of a sweet looking cover, and the front of the local weekly contained my story and one on Saskatoon Hilltops head coach Tom Sargeant penned by Keenan Sorokan. My story on Flory talks about how he is preaching that everything matters with the Huskies football team. Before becoming the Huskies head coach, Flory had been team’s offensive coordinator for the three previous seasons. Sorokan’s story focuses on the colourful impact Sargeant has had on the success of the Hilltops. Sargeant has been the Hilltops head coach since 1998, and he has guided the team to 10 CJFL titles. If you have a chance, be sure to big up a hard copy of the Express, which can be found in yellow dispensers located throughout the city. Hilltops DL Tom Schnitzler (#56) fires off the line to rush the quarterback. Tom Schnitzler was thankful he was smart on the spot, when he got a surprise call from the CFL ranks during a six-week travel trip in Europe. The star defensive lineman with the Saskatoon Hilltops was surprised to receive a text invite to Saskatchewan Roughriders training camp. The call came shortly before the Roughriders opened training camp in Saskatoon on May 28. At first, Schnitzler’s spirits sank, because wasn’t able to attend training camp, but he made sure to send a response that intended to keep the door open. “I told them when I was going to be back,” said Schnitzler. “Right when I got back, I got a text from (Roughriders assistant vice-president of football operation and administration) Jeremy O’Day. Tom Schnitzler listens to a call from the sidelines. Schnitzler was added to the Roughriders practice roster as a territorial junior player on July 4. He spend five weeks with the team living in Regina the entire time and only came home on weekends when the Roughriders were on the road. On Saturday, Schnitzler celebrated his 22nd birthday helping his Hilltops bury the Ottawa Sooners 49-15 in a cross-conference Canadian Junior Football League regular season clash at Saskatoon Minor Football Field. While the Hilltops improved to 3-0 winning their home opener, the chance to join the Roughriders practice squad turned out to be an early birthday gift. Schnitzler’s confidence in himself grew the more he hit the field with the CFL club. “The first week or two I was there I felt completely out of place,” said Schnitzler, who stands 6-foot-4 and weighs 235 pounds. “By the end of end of it, realistically, I felt like I belonged there, and I feel like it drives me to be a better athlete and practice harder and work for it. While with the Roughriders, Schnitzler again benefited from the fact he said the right thing at the right time. He initially came to the CFL club as a linebacker and didn’t get a lot of repetitions, because the Roughriders are deep in that position. Hilltops DL Tom Schnitzler checks out his pre-snap reads. Two weeks into his stay with the CFL club, the Roughriders made some transactions creating an opening on the defensive line. Schnitzler mentioned what his natural position was with the Hilltops and was moved to the defensive line. During his last three weeks with the Roughriders, Schnitzler was playing on the defensive line’s second team and receive a lot of repetitions. He loved every moment of that opportunity and soaked in the experience as much as he could. Overall, he said his experience with the Roughriders helped him both on and off the field. “I feel like I learned a lot not only like physically on the field, but just like studying film and everything too,” said Schnitzler. “It is just being a pro. DL Riley Pickett makes a sack for the Hilltops. While Schnitzler hopes of playing with the Roughriders one day took a boost upwards, he was still pumped to rejoin the Hilltops to play out his fifth and final season of junior eligibility. He sees the Hilltops as a big extended family, and he sometimes almost doesn’t believe he is playing out his final campaign. “These five years have gone by crazy fast,” said Schnitzler, who is one of the defensive captains for the second straight year. “Being one of the older guys and one of the leaders on the team, it is awesome giving back to the younger guys like I was given to when I was a rookie and a second-year guy too. Against the Sooners on Saturday, Schnitzler spent a lot of time encouraging and helping the team’s younger players as the starters sat for much of the second half in the runaway win. The Hilltops rolled out to a 28-0 lead by the end of the first quarter. Star running back Logan Fischer ran home three majors in the opening 15 minutes finding paydirt from seven, 10 and eight yards out. Receiver Jason Price hauls in a touchdown reception for the Hilltops. Quarterback Jordan Walls hit receiver Jason Price with a 33-yard touchdown strike on a streak pattern to round out the first quarter scoring for the home side. Saskatoon’s lead grew to 35-0 just past the midway point of the second quarter, when Fischer ran the ball in from five yards out to complete a personal four-touchdown night. He piled up 137 yards rushing on 15 carries. The Sooners got on the board with 4.1 seconds to play in the second quarter, when backup quarterback Evan Yourth hit receiver Enzo Trunzo with a 10-yard touchdown toss to cut the Hilltops lead to 35-7. Sooners starting quarterback Tyler Scott left the game due to injury near the start of the scoring drive that ended on Trunzo’s major score. Early in the third quarter, the Hilltops went ahead 42-7, when Walls hit receiver Sam Mike with an 18-yard scoring strike to eliminate any faint hopes the Sooners had of a rally. Running back Logan Fischer scores one of his four TDs for the Hilltops. Ottawa’s scoring was rounded out in the fourth quarter with the Hilltops conceding a safety and Yourth hitting receiver Malcolm Carter with a seven-yard touchdown toss. The Sooners two-point conversion attempted after Carter’s score was unsuccessful. Running back Joshua Ewanchyna ran the ball in from a yard out late in the fourth quarter to conclude the Hilltops scoring on the night. Walls completed 14-of-23 passes for 225 yards, two touchdowns and no interceptions for the Hilltops. Yourth connected on 12-of-22 passes for 150 yards, two touchdown passes and one interception for the Sooners (0-3). Trunzo hauled in seven passes for 106 yards to go with his major score on the night for Ottawa. Receiver Sam Mike makes a catch in the air for the Hilltops. Defensive end Riley Pickett and defensive back Colton Holmes each recorded a sack for the Hilltops. Sophomore defensive back Johnathon Sexsmith had an interception for the hosts. While the win was convincing, Schnitzler said the game was an up and down one for the Toppers. “I liked the start, but I feel as the game went on we kind lost focus, and we kind of lost our pop in there,” said Schnitzler, who had a forced fumble and was often faced double team blocks in the win. “The start was good. As the season progresses, Schnitzler is savouring each moment as it comes. Ultimately, he would like to help the Hilltops win the CJFL championship for a fourth year in a row. The Hilltops celebrate improving to 3-0 this season. After seeing a number of his former fifth-year teammates graduate from the program winning the CJFL title in their final game over the past three years, Schnitzler would like to follow in their footsteps. “Being a fifth-year guy, that is why you come back every year,” said Schnitzler. “You see the fifth-year guys go out (on top), and that is the best feeling in the world for them. The Hilltops return to action when they host the Regina Thunder at 7 p.m. on Sept. 9 at SMF Field. Running back Adam Machart powers upfield for the Hilltops. You have to love Saskatoon Hilltops game day. Since 1947, the Hilltops have been a huge source of pride for “the Bridge City.” They have had a run of success that is unmatched anyway capturing 19 Canadian Junior Football League championships in their history. They have always prided themselves in winning the right way. Besides succeeding on the field, they want their players to graduate from the program as first rate people, who are very community minded. Playing in their 71st season of existence, the Hilltops have again fielded a team of first-rate individuals who are worth getting behind. They have opened the 2017 campaign winning their first two regular season games, which were both on the road. They already made one really cool memory opening the campaign on Aug. 12 downing the host Thunder in Regina 37-20 in the first game both sides played at new Mosaic Stadium. About 800 to 900 fans from Saskatoon followed the Toppers down to “the Queen City,” and the players appreciated the site of their supporters. When the contest finished, the players and coaches met the fans, who lined the front row of the facility’s West side, to pass on appreciation and enjoy that moment. Another cool memory was made when the Hilltops traveled to Winnipeg last Sunday to blank the host Rifles 44-0. The long trips to the Manitoba capital always provide a great chance to bond. Ryan Turple gains yards after the catch for the Hilltops. Tonight, the blue and gold open their home regular season schedule hosting the Ottawa Sooners (0-2) of the Ontario Football Conference at 7 p.m. at Saskatoon Minor Football Field. The Hilltops are still that good old neighbour that brings a smile to your face, and when they succeed, you feel extremely proud of them. As always, there are always tonnes of cool storylines to watch with the Hilltops. One is watching fourth-year quarterback Jordan Walls take over the starting reins from Jared Andreychuk, who graduated after winning a third straight CJFL title as the top signal caller. Walls, who is a graduate from Saskatoon’s Tommy Douglas Collegiate, was more than prepared to take on this opportunity. He has been stellar in his first two career starts completing 35-of-57 passes for 475 yards, four touchdowns and one interception. Fifth-year star running back Logan Fischer entered his final season with the Hilltops after participating in this year’s training camp of the CFL’s Saskatchewan Roughriders. He has already piled up 251 yards rushing on 40 carries and scored three touchdowns. Third-year running back Adam Machart is earning a bigger role with the offence as each game passes. He has carried the ball 31 times for 171 yards and scored one touchdown. At receiver, veterans Sam Mike, Ryan Turple and Jason Price continue to make big plays. Joe Trumpy and Adam Ewanchyna are striving to get increasingly in the mix. Hilltops QB Jordan Walls fires a pass downfield. The offensive line is filled with newcomers to starting spots, but it is steadied with Patrick Arno calling the signals starting at centre for a second straight campaign. Fourth-year veteran Kirk Simonsen anchors the unit at right tackle. Defensive lineman Tom Schnitzler came into his final season with the team after spending time on the Roughriders practice roster. He might possibly earn a longer CFL look in the future. Cameron Schnitzler, Cody Peters, Riley Pickett and Adam Benkic have been lights out at linebacker. Defensive backs Leif Larson and Logan Kelsey-Stern both have interceptions in the early going and safety James Vause has been the model of consistency on the field and class off the field. You also wonder what other roles Rylan Kleiter will take on in addition to his receiving and kicking duties. Besides performing those duties admirably, he stars and wins lots of trophies on the ice curling, when he isn’t on the football field. Of course on the sidelines, everyone loves watching the passion and fire of head coach Tom Sargeant. The Hilltops always symbolize Saskatoon at its best. If you find are wavering about going to tonight’s game, just get out to SMF field. You will likely see something special. Duane Dmytryshyn’s names is on the CFL’s diversity T-shirt. I was back in the pages of the Saskatoon Express this week with a little bit of a different story with Duane Dmytryshyn, who is the receivers coach with the University of Saskatchewan Huskies football team. Dmytryshyn, who played slotback in the CFL from 1993 to 2000 with the Calgary Stampeders, Toronto Argonauts and Saskatchewan Roughriders, was surprised and proud to have his name included on a T-shirt the league put out to stand for diversity and inclusion. Dmytryshyn’s background is Ukrainian. The Huskies opened their 2017 campaign dropping an exhibition tilt 22-10 on Friday night in Hamilton, Ont., against the host McMaster University Marauders. Fourth-year starting quarterback Kyle Siemens completed 11-of-19 passes for 113 yards and one interception in two quarters of work. Backup Mason Nyhus, who was a redshirt last season, completed 12-of-25 passes for 143 yards and three interceptions. Running back Colton Klassen ran the ball 11 times for 115 yards for the Huskies. The Huskies open the regular season on Sept. 1, when they travel to Winnipeg to face the U of Manitoba Bisons. The Express story on Dmytryshyn can be found right here. An LP of Guns N’ Roses debut album. That was my first reaction when I saw the ticket prices for the Guns N’ Roses concert in Regina on Sunday at new Mosaic Stadium. When I looked at the Ticketmaster map to see how well ticket sales were going, I began to question if I was lost with some parts of today’s world. The prices were outrageous. Most seats were tagged at $165 and upwards plus fees. Floor seats were going for $275 plus fees. Admission for the standing pit area in front of the stage was $350 plus fees. Tickets are also available for $75 each plus fees, and a handful of those went on sale in the north end zone of new Mosaic. The Friday ploy is a standard entertainment industry practice were a handful of tickets are held for release a couple of days before the event. While the pricing was a shocker, the other shocker was tickets were selling. The Ticketmaster stadium map was dominated with white, which is the colour that marks a sold seat. The back of a Guns N’ Roses debut album in LP format. The biggest concentration of open seats are in the two most expensive areas on the floor and in front of the stage. With that said, the floor is about 60 per cent sold. Doors open for Sunday’s show at 4:30 p.m., Our Lady Peace goes on stage at 6:15 p.m. and Guns N’ Roses hits the stage at 7:30 p.m.
GnR’s current tour is dubbed the “Not in this Lifetime….. Tour,” and it features the reunion of core members in frontman Axl Rose, lead guitarist Slash and bassist Duff McKagan. Anyone that is aware of this band’s history figured this reunion would never happen. Following the band’s heyday in the late 1980s and early 1990s, Slash departed in 1996 and McKagan followed in 1997. The feuds between Rose, 55, Slash, 52, and McKagan, 53, appeared to revolve around ego. A reunion of the three core members was always possible from the standpoint it could happen because way too much money could be made. That reason was a big factor in KISS reuniting with its original lineup in the late 1990s. Motley Crue would constantly fly apart and reunite bringing in boatloads of money in the process. CDs of GnR’s Use Your Illusion albums. In the case of KISS and Motley Crue, there always seemed to be an underlying respect and actual brother type caring between the band members. In Guns N’ Roses case, it seemed like tensions were always so toxic that a reunion would never happen. At times, it seemed tensions were beyond toxic as far as a hate meter was concerned. When Rose, Slash, and McKagan, did get back together in early 2016 and their initial reunion grew into the band’s current tour, I know for myself I didn’t know how to take it. It should also be noted my high school sweetheart hated Guns N’ Roses in an extreme way, and that might have played a part in us breaking up right after her high school graduation ending a two-year relationship, but I digress. That part of my life would appear on the odd occasion during my university years in Regina. I sang “Patience” and “Don’t Cry” at the impromptu after party of the University of Regina Cougars award night in 1998 at the now defunct Bart’s On Broad in Regina. In my best suit out of all things, I sang in front of all the school’s athletic teams and a number of coaches, who clearly enjoyed the entertainment that night. Guns N’ Roses concert VCR tapes from a show in Tokyo. Most of Guns N’ Roses songs had a rage and emotion to them that seemed linked to the late 1980s early 1990s time period. Even power ballad type songs like “Sweet Child O’ Mine,” “Don’t Cry” and the softer “Patience” required you get to that emotional point that was linked to a romantic relationship. You went to KISS to enjoy yourself and to Motley Crue to party. I paid $145.50 for a floor seat for Motley Crue’s farewell tour stop in Saskatoon in December of 2015, when they toured with Alice Cooper. Both groups put on iconic performances that night that were true to who they were. Guns N’ Roses was an attitude and you went to a show to act out in a pissed off way. Concerts in 1991 in St. Louis and 1992 in Montreal ended in riots, and part of the draw was seeing an act that was so unstable that mayhem might break out. I had a friend that went to the Montreal riot show, where GnR toured with Metallica, and he recalled seeing live fires all over the place. A Guns N’ Roses VCR tape. In recent years even before the reunion, I often saw signs that the band wasn’t forgotten. The GnR tribute band The Nightrain seems to have been around forever. I would see Guns N’ Roses T-shirts on sale in respectable clothing outlets, which was something you would never see in the late 1980s or early 1990s. I would also see the odd young lady in her late teens wearing a GnR T-shirt or the T-shirt of another hard rock band that made its name in the 1980s. It always struck me how these young ladies knew of these bands. In early April, I was in Prince Albert covering hockey. I was checking out a retail store hours before the hockey game, when I visited with a really good looking young lady with blonde hair, who had to be 18 or 19 years of age. She was wearing a Guns N’ Roses tour T-shirt, and she had the bottom part tied to her waist, so the T-shirt fit tight to her body. She also donned black yoga pants and cute set of sandals. She looked amazing. I told her stories about the band in its heyday, and she was entertained and laughed with amusement at them. She was clearly in for the nostalgia. It struck me you would never see any young ladies dressed like her back in the band’s heyday, where GnR’s every day female fans dressed like tough head banger chicks with tight jeans or black leather pants. They also wore stylish footwear that could do damage in a fight. They still looked hot, but they had the image that they could really mess you up if given the chance. So far on their current tour, Guns N’ Roses sound like they are delivering. They are expected to have one of the top grossing tours of 2017. 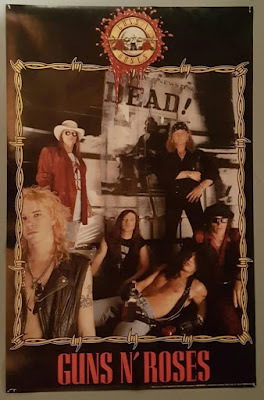 A Guns N’ Roses poster from 1991. They played at Investors Group Field in Winnipeg on Thursday night. According to the review in the Winnipeg Free Press, which is one of the last bastions of good independent journalism in Canada, Guns N’ Roses turned back the clock and were as good as their best days in their prime ripping through a three-hour set. The show also started on time, which harkened back to the fact GnR concerts had a habit of starting notoriously late in the early 1990s. Having only casually followed news on the band since 1996, I am finding I can’t get myself back in that emotional place to go see one of their shows. On an impulse whim, I find I can’t dish out money for a ticket with the crazy prices that are being charged. Judging by Regina ticket sales, a lot of people want to see the reunited band, and they are willing to pay big amounts of money to do it. I hope they enjoy the show and the band impresses. For me, my passions in life have changed, so I believe I will take a pass on this concert. Michael Farren, left, and Jantzen Leslie model the Blades Pac-Man uniforms. Colin Priestner chuckled it might have been the worst kept secret in Saskatoon sports history. Actually, it might have been the most welcomed worst kept secret in Saskatoon sports history. For the last few months since the Saskatoon Blades 2016-17 campaign came to a close in March, the team had been using its classic blue and gold Pac-Man logo in its various communications. The logo and colours became prominent on the team’s Twitter and Instagram handles as well as its website. The traditional Pac-Man jerseys were used during team press conferences and public appearance functions. The appearance of the Blades dressing room was changed to the full out Pac-Man look. The Pac-Man jerseys have been utilized on special occasions and on more of third jersey status in recent years. A call from fans had been out for a lengthy time to bring that look back as the club’s regular look, and the frequent appearance of that style increased hopes the Blades would use that look again on a regular basis. Leslie Jantzen grins in the Blades blue Pac-Man uniform. “The first day we got the team people were emailing bring the Pac-Man back,” said Priestner, who father, Mike, purchased the Blades before the start of the 2013-14 campaign. “We’ve tried to bring the Pac-Man back at times, but there are definitely limitations in lead times in the WHL as to how quickly you can get things done. The development drew praise over social media channels with one Regina Pats fan saying on Twitter the Blades Pac-Man jerseys have to be two of the best in hockey history. The Pac-Man jersey look is by far the most identifiable one the Blades have ever had. The team sported the blue and gold Pac-Man style as a regular look for 12 seasons from 1982 to 1994. Michael Farren shows off the Blade white Pac-Man uniform. During those 12 campaigns where tie games existed, the Blades posted a 479-353-32 regular season record, had six campaigns with 40-or-more wins, made the WHL playoffs 10 times, advanced to the WHL Eastern Conference championship series five times and fell in Game 7 of the WHL Championship series in 1992 and 1994 to the Kamloops Blazers. The Blazers went on to win the Memorial Cup in both those campaigns. They wore the Pac-Man jerseys as the Memorial Cup host team in 1989, where they dropped a heartbreaking 4-3 decision in overtime to the Swift Current Broncos in the event’s championship game. Tim Tisdale scored the overtime winner for the Broncos. The Pac-Man was the look worn by Blades legend Wendel Clark, who went on to star with the NHL’s Toronto Maple Leafs after being selected first overall in the 1985 NHL Entry Draft. It was the look sported by star netminders Tim Cheveldae, who is currently the team’s goaltending coach, and Norm Maracle. Standout defencemen Trent Yawney, Curtis Leschyshyn, Richard Matvichuk and Rhett Warrener all wore this style too. High scoring forwards Lane Lambert, Kevin Kaminski and Frank Banham all donned the Pac-Mans. The look had toughness as the Pac-Mans were the uniforms of heavyweights Joey Kocur, Kelly Chase, Tony Twist and the late Wade Belak. Blades head coach Dean Brockman, whose team has missed the playoffs for the past four seasons, welcomed the fact the Pac-Mans will be the team’s regular look. “I love it,” said Brockman. “I think it is great. There is a lot of history in that logo. Braylon Shmyr, left, celebrates a goal last season in a classic look. 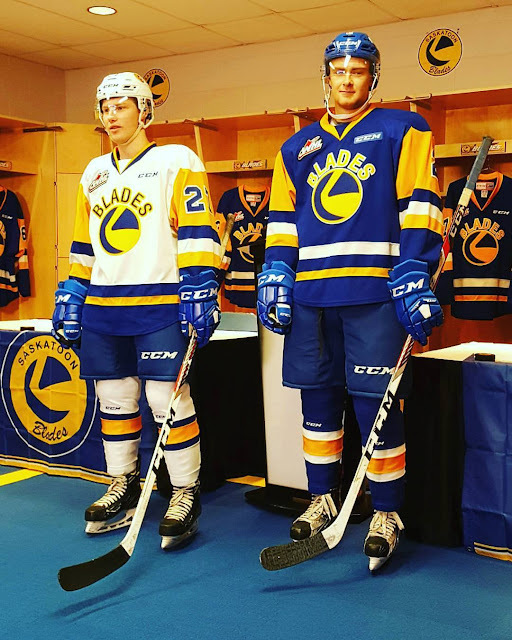 With the move back to the Pac-Mans, the Blades have retired the “SB” logo and the double blue colour scheme that was their main look. Colin Priestner was well aware fans were fond of the Pac-Man look due to what the team accomplished while wearing it. “People have been asking for this,” said Priestner, whose has missed the playoffs for the past four seasons. “They associate these jerseys with better days. “I think that is one of the reasons we wanted to have them back was just too really kind of have a visual change. We have had four years of real trouble in terms rebuilding in having to kind of going through what you have to in this league to rebuild. Blades HC Dean Brockman speaks to the media at the SaskTel Centre. The Saskatoon Blades solidified their coaching ranks for the foreseeable future. On Thursday, the team announced head coach Dean Brockman and assistant coaches Bryce Thoma and Ryan Keller have been signed to multi-year contract extensions that run through to the end of the 2019-20 season. Assistant coach Jerome Engele and goaltending coach Tim Cheveldae, who have been in their roles for a number of seasons, will also return for another campaign. Brockman, Thoma, Keller, Engele and Cheveldae all worked together as a unit in their present roles for the first time last season. Despite a large rash of injuries, they guided the Blades to a ninth overall finish in the WHL’s Eastern Conference with a 28-35-7-2 record to sit five points back of the Calgary Hitmen for the conference’s final playoff berth. While the Blades failed to make the post-season for the fourth year in a row, last season marked the closest the franchise has come to earning a playoff berth since being purchased by Mike Priestner before the start of the 2013-14 campaign. Priestner took over a club that faced a long rebuild after hosting the Memorial Cup championship tournament in 2013 and also loaded up to try and make a long playoff run in 2011, which ultimately ended in the second round. During a news conference held at the SaskTel Centre on Thursday, Blades general manager Colin Priestner, who is Mike’s son, said it was important for continuity to keep the current coaching staff together. “It was just something that was just logical for me and our management,” said Priestner. “It was just a trying season on all regards, and I think they just showed throughout the year they got better and better. Blades GM Colin Priestner announces the coach contract extensions. Brockman joined the Blades as an assistant coach before the start of the 2014-15 season and moved up to head coach in June of 2016, when former head coach Bob Woods moved on to be an assistant coach with the NHL’s Buffalo Sabres. Woods is now an assistant head coach with the NHL’s Minnesota Wild. Before joining the Blades, Brockman was best known for his 17 years in the junior A ranks working with the Humboldt Broncos from 1997 to 2014. He started as an assistant coach and assistant general manager before becoming the head coach and general manager in 2004. During Brockman’s years in Humboldt, the Broncos won the Royal Bank Cup for junior A supremacy in 2003 and 2008. Brockman was pleased to see his contract get extended to run in total for the next three seasons. “I think it is big, because it tells your players that I am going to be the guy that they are going to have to listen to over the next couple of years,” said the 50-year-old veteran bench boss. “You just develop that deeper rapport with them. Brockman added to was key to have Thoma, 35, Keller, 33, Engele, 66, and Cheveldae, 49, all back on the staff together for another season. “We have to be one unit,” said Brockman. “Having those guys back, it is great. “There is not a lot of awkwardness, because we know what everybody is thinking. It is just everybody knows how to react to things. Obviously, you tweak things throughout the year and see what you did wrong. Brockman plans to be consistent in his style. “I’ve been a players’ coach all my life,” said Brockman. “I think my players respect me as I respect them. Blades HC Dean Brockman is ready for the season to start. With all the injuries that occurred last season, Priestner was impressed with how Brockman and his staff keep the players positive and the team moving forward. “The hits just kept on coming, and they dealt with them extremely well,” said Priestner. “I think the group that we had really jelled together over the year. The Blades open training camp on Saturday with player registration at the SaskTel Centre, fitness testing at the Elite Pro Performance Centre and ice sessions that run from 4 p.m. to 7:30 p.m. at the SaskTel Centre. Camp continues all day Sunday and Monday with scrimmages at the SaskTel Centre. All on ice sessions are open to the public. Jordan Walls threw a pair of TD tosses for the Hilltops. When the Saskatoon Hilltops had the wind at their backs, they made the Winnipeg Rifles pay. On Sunday with a strong wind blowing at St. Vital Mustangs Field in Winnipeg, the Hilltops scored all of the game’s points when they were driving with the wind to bomb the host Rifles 44-0. After playing through a scoreless first quarter in the Week 2 Canadian Junior Football League encounter, the Hilltops piled up 33 points in the second quarter and 11 points in the fourth quarter working with the wind. The scoring run in the second quarter was sparked by the fact the Hilltops forced the Rifles to go two and out on a number of their offensive series. When Winnipeg was unable to get any good punts off into the wind, the Hilltops took advantage of good field position. Saskatoon jumped ahead 14-0 early in the fourth quarter with two touchdown runs from star running back Logan Fischer, who scored from a yard out and five yards out. Fischer’s second rushing major capped a short 21-yard touchdown drive that was set up by a short Rifles punt and no yards and objectionable conduct penalties on the host side. Winnipeg conceded a safety due to being pinned in their end to give Saskatoon a 16-0 edge. Safety/kicker James Vause booted a 17-yard field goal to push Saskatoon’s lead out to 19-0. The Hilltops proceeded to put together a 65-yard scoring drive that was capped by a one-yard touchdown pass that saw quarterback Jordan Walls hit defensive lineman Tom Schnitzler on a gadget play. Schnitzler lined up as a tight end in Saskatoon’s short yardage package and came open on a play-action pass play. His catch gave the visitors a 26-0 edge. With 8.2 seconds to play in the first half, Walls hit receiver Jason Price with a nine-yard touchdown pass to give the Hilltops a 33-0 lead. The teams proceeded to play through a scoreless third quarter, and just four seconds into the fourth quarter, Walls ran in for a major from three yards out to give the Hilltops a 40-0 lead. The Rifles conceded two more safeties late in the frame to round out the scoring in the Hilltops 44-0 romp. The Rifles couldn’t manufacture any points in the first and third quarters working with the wind, because the Hilltops defence wouldn’t allow it. In the first quarter, Hilltops linebacker Riley Pickett had the biggest highlight recording two sacks, which came on back-to-back plays. Sophomore defensive back Leif Larson had the biggest highlight in the third quarter making an interception on a tipped pass. Fischer had a monster game for the Hilltops carrying the ball 27 times for 186 yards, and he hauled in two passes for 11 yards. With the win, the Hilltops, who are the three time defending CJFL champions, improved to 2-0, while the Rifles fell to 1-1. The Hilltops return to action this coming Saturday hosting their home opener at Saskatoon Minor Football Field at 7 p.m. against the Ottawa Sooners (0-2). The Rifles travel to Edmonton to take on the Wildcats (0-2). Matthew Baraniuk runs in a TD during the Huskies scrimmage. The University of Saskatchewan Huskies football team hit the field for their first live game style action on Friday with their Green vs. White scrimmage. With the Huskies coaching staff engaged in evaluations giving players opportunities in various roles, it was tough to come away with any judgments from the intrasquad match. The overall play seemed very solid on the surface. Some of the highlights saw running back Shakur Harris high hurdle a would-be tackler playing for Team Green. Defensive back Brooks Falloon had a nice pick-six for Team White. Rookie running back Matthew Baraniuk had some nice runs and scored a touchdown playing for Team White. When the dust settled, Team White came away with a 19-7 win. After a day off on Saturday, the Huskies resumed training camp activities with a couple of practices on Sunday. They head to Hamilton for a U Sports exhibition match against the McMaster University Marauders this coming Friday. The Huskies open the regular season traveling to Winnipeg for a clash against the U of Manitoba Bisons on Sept. 1. It appears Sophie Shirley’s hockey home will be with the Calgary Inferno for the upcoming season. On Sunday, the Inferno selected Shirley in the third round and 19th overall in the Canadian Women’s Hockey League Draft. Shirley, who is a graduate of the Saskatoon Stars female midget AAA team, wrote on Twitter she looked forward to the upcoming season with the Inferno. Shirley played 36 games last season with the Okanagan Hockey Academy’s female prep team based out of Penticton, B.C., collecting 32 goals and 28 assists. The skilled centre just finished taking part in Canada’s National Women’s Development Team selection camp. For the past two seasons, Shirley was a member of Canada’s under-18 women’s team. She officially dressed for her first two games with Canada’s Senior National Women’s team in December of 2016 as part of a two-game series in Sarnia, Ont., and Plymouth, Mich., against the United States. The CWHL was formed in 2007 to create an elite league to give a place for top level women’s players to continue to develop their skills. A number of national team players from various countries play in the CWHL, which operates as a not-for-profit enterprise. Last season, the Montreal Canadiennes downed the Inferno 3-1 in the CWHL championship game to capture the Clarkson Cup. Shirley has committed to play for the University of Wisconsin Badgers women’s hockey team in the National Collegiate Athletic Association ranks. She is putting off joining the Badgers for a season in order to play her freshman year with friend Emily Clark, who is on Hockey Canada’s 28-player centralized roster for the Senior National Women’s team. Hockey Canada will eventually select 23 players from that roster to play on the Senior National Women’s team that will compete at the 2018 Winter Olympics, which are set to run Feb. 9 to 25 in Pyeongchang, South Korea. The Inferno also selected left-winger Kennedy Brown in the ninth round and 61st overall in the CWHL Draft from the Rocky Mountain Raiders midget AAA in Alberta. Brown, who had seven goal and 11 assists in 24 regular season games in her 16-year-old campaign with the Raiders last season, has committed to join the U of Saskatchewan Huskies women’s team in 2018. Brayden Schenn takes part in the Chase Fantasy Hockey Camp. This year’s Kelly Chase Fantasy Hockey Camp held at the Harold Latrace Arena welcomed the influx of a few local area youngsters who are still playing in the professional hockey ranks. The professional participants at this year’s camp, which concluded on Saturday, included my young cousin and defenceman Nelson Nogier, who finished up his rookie professional campaign last season playing 10 games for the NHL’s Winnipeg Jets, left-winger Taylor Leier, who played 10 games last season with the NHL’s Philadelphia Flyers as a third year pro and centre Chandler Stephenson, who played four games last season with the NHL’s Washington Capitals as a third year pro. Centre Lane Pederson was also on the ice, and he played his 19-year-old campaign last season with the WHL’s Swift Current Broncos and has an NHL entry-level contract signed with the Arizona Coyotes. Brayden Schenn, who spent the majority of the past six seasons playing centre for the NHL’s Flyers, was back as one of the returning regulars at the Chase Fantasy Hockey Camp. The skilled centre, who will turn 26 on Tuesday, will suit up for the St. Louis Blues for the upcoming NHL season. Schenn, who starred in the WHL with the Brandon Wheat Kings and Saskatoon Blades from 2007 to 2011, was dealt to the Blues during a trade that was made at last June’s NHL Entry Draft. The Kelly Chase Fantasy Hockey Camp is an event that raises funds for local Saskatchewan charities. It has been held in Saskatoon for three straight years. The concept of the camp allows anyone from the public to purchase a spot at the camp for the chance to rub shoulders with former and current NHLers and be treated like a professional player. That means trainers and staffers set up your stall and prepare your equipment in the exact way that happens in the NHL. Teams of 14 players can join the camp at the cost of $20,000, or individuals can register for $2,500. The teams at the camp add to their rosters by drafting from a pool of former and current players who are at the camp. The draft order is determined by a draft auction. The camp concludes with the highest bidding team from the draft auction getting the chance to play a team made up of former and current NHL players. At this year’s final game, the NHL team came away with an 8-7 victory. Overall, the Chase Fantasy Hockey Camp has become a fun annual social fundraiser.